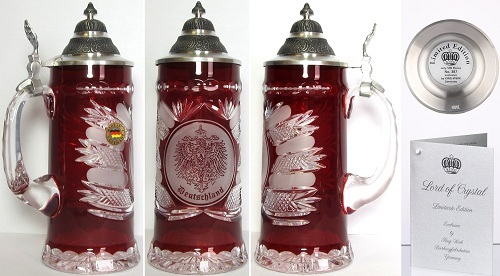 •Germany Crystal Stein •Lord of Crystal •500 piece limited edition •Handcrafted in Germany by King Werks •Made of crystal with pewter lid •Approx 9.5 inch tall (24cm) •.5 liters •This part number is for ONE stein. •This unique collector's series features only pieces handmade of genuine "Crystal-Glass" by artisan workman. This product is a collectible of superior quality and true elegance. In production the crystal is first hand-blown in a wooden mold by experienced artists, to then be carefully and precisely finished by hand; cut by cut to create the precious and unique look of this item. This work demands decades of experience in working with the traditional tools and materials, which have already been used by our forefathers. We have exclusively selected true specialists to craft these fine masterpieces. All metal details contained in this product are also hand-cast and crafted of genuine pewter with a minimum of 95% pewter content, meeting the highest standards of strength and purity.